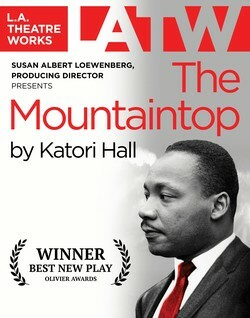 The College of Fine Arts and the Office of Multicultural Affairs at Stephen F. Austin State University, along with L.A. Theatre Works, will anticipate the 50th anniversary of the death of Dr. Martin Luther King Jr. with a touring presentation of the internationally acclaimed play "The Mountaintop," written by Katori Hall and directed by multiple award-winner Shirley Jo Finney. The performance is part of the College of Fine Arts' University Series and will be presented at 7:30 p.m. Saturday, Feb. 3, in W.M. Turner Auditorium on the SFA campus. NACOGDOCHES, Texas - In 2018, America and the world will mark the 50th anniversary of the death of Dr. Martin Luther King Jr.